Two teens have been charged with murder in the deaths of a Louisiana oil-company manager and his son, authorities revealed Sunday, according to the Daily Mail. 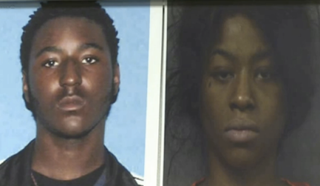 Neither Haraqyon Degruy, 18, nor her friend Dexter Allen, 17, have any “significant” criminal history, officials say, and authorities are still trying to figure out the motive for the slayings, as well as the connection between the teens and their alleged victims. David Pence, 56, was shot three times in the chest while he was sitting in an armchair; his son, Nicholas Pence, 25, was shot in the face and the back, according to the site. According to the Daily Mail, the shootings could have been the result of an armed burglary gone wrong, since the two teens were allegedly linked to recent car break-ins. David Pence’s wife found the two men, who had been celebrating a football game win in their garage on Wednesday, when the shooting occurred and she said she heard the gunfire. The Mail reports that they had said goodbye to stragglers at the party when they were attacked. Authorities believe that Allen was the one who killed the two men before running out to the car and telling Degruy, who then allegedly drove off. Degruy has been charged with being an accessory to first-degree murder and vehicle burglary, while Allen has been charged with fleeing police and first-degree murder.